Security camera footage of man wanted for three bank robberies in the past week. A suspect with stretched earlobes has robbed another bank, his fourth in a week. Ottawa police say the man, who has prominent earlobe-stretching “gauges,” tried to rob a bank in the Gloucester Centre on Ogilvie Road just after 4:30 p.m. on Tuesday. He gave the teller a note that said he had a gun and demanding money, but left when confronted by a bank employee. No gun was seen and the suspect ran away without getting any money. The same man is the suspect in three other robberies, dating back to March 24. Earlier images of the suspect being sought for multiple bank robberies. Police said the man gave a note demanding cash to a teller at a bank at the South Keys Shopping Centre near Bank Street and Johnston Road around 4 p.m. on March 24. The suspect left the bank with an undisclosed amount of cash and was last seen running along a footpath toward Johnston Road. 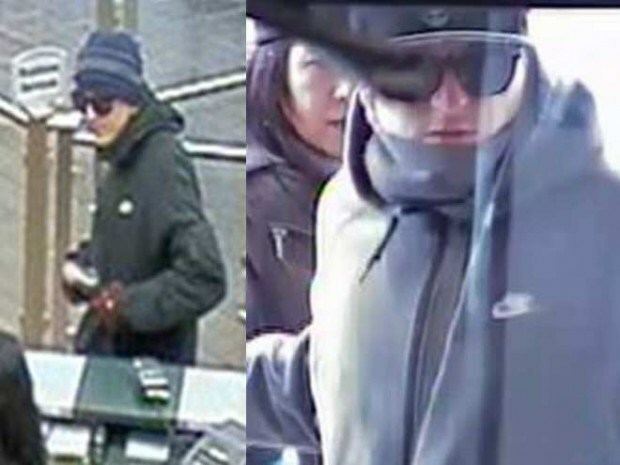 On March 27 around 2 p.m., the same suspect told a teller at a bank on Montreal Road near Ogilvie Road that he had a gun and demanded cash. Police said no gun was seen. Two days later, the same suspect went into a bank at St. Laurent Mall and demanded money from a teller, again presenting a note that said he had a gun. The suspect is described as white and about five-foot-eight. He wore sunglasses and a hat that did not conceal his stretched earlobes, which were seen by witnesses. Anyone with information can call the Ottawa police robbery unit at 613-236-1222, ext. 5116 or Crime Stoppers at 1-800-222-8477. When it comes to Criminals in Ottawa the Ottawa Police is full of them. They wear Police Uniforms and work for the Ottawa Police. Take Sgt. Peter Van Der Zander. This lowest form of life Fabricates Evidence NOT to charge women who attempt to murder their husbands. Recently, a father called police because his wife attempted to strangle him. When he got her hands off his throat the police found him bleeding around the neck from the force of her fingernails dug into his windpipe. Van Der Zander in a typed General Occurrence report claimed she denied attempting to choke him. A video of the interview showed that Peter Van Der Zander never asked her the question. Months later, and two days after she completed an anger management course, she assaulted another father, numero dos, with both hands around his neck with her thumbs interlocked around his windpipe, she coldly told him "My father was KGB, I know what I am doing". When that father reported it the assault to the Ottawa Police they did NOTHING. When she found out about the report to Police, she threatened him to withdraw the complaint or she would make false allegations to have his kids taken away just like she did to Numero Uno. When he reported that to the Ottawa Police they did nothing. The Ottawa Police then fabricated evidence to justify charges against one of those fathers and when the police were advised of an endless string of perjury they did nothing. If you want to meet Real Criminals, you can find hundred of them at 474 Elgin Street Ottawa.